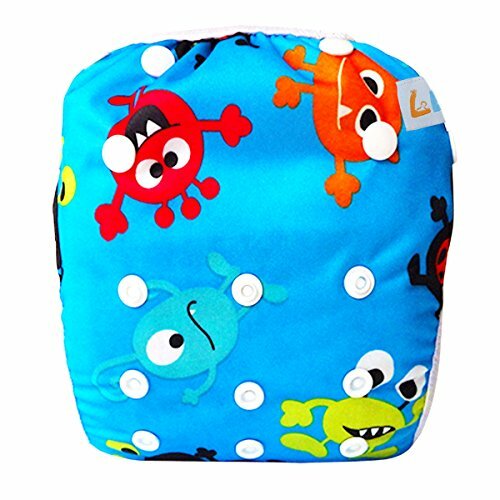 LBB One Size Reusable Washable Adjustable Baby Swim Diapers Fit babies 0-18 months LBB Swim Diaper is a novel design with adjustable snaps, which you can change to the appropriate size to fit the baby well. The outer layer is 100% Polyester with PUL, can hold solids, the inner layer is Polyester Mesh which offering comfort against baby's sensitive skin, also easy to wash. The elastic waist and legs provides a secure, stretchy fit and easy on and off .A snug fit in the legs and waist is the key to avoid leaks. You and your baby are worth having. Outer - 100% Polyester outer layer with PUL. Inner - Polyester Mesh, easy to clean up. Wash temperature: Less than 86 Fahrenheit to prevent the PUL from delaminating. These one size swim diapers are comparably small, if your baby is bigger or need much more room to grow up, we may suggest you to visit the big one size ones. Stop Wasting Money, Start Saving Now.Wish You a Happy Shopping Experience!